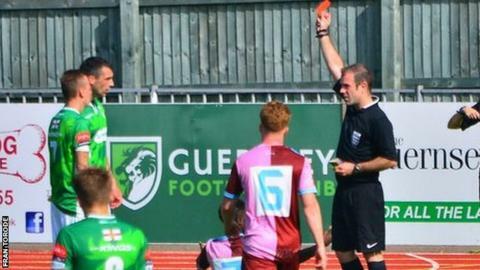 Ten-man Guernsey FC suffered their heaviest home defeat of the season as they lost 4-2 to Corinthian Casuals. Jamie Dodd was dismissed before half-time after receiving two yellow cards. Casuals took the lead when Emmanuel Akokhia fired home after 50 minutes, and the striker doubled his side's lead a minute later as he volleyed home. Juevan Spencer made it 3-0 after 80 minutes, Matt Loaring got one back soon after, before Matt Reece got a fourth and Ross Allen replied late on. The loss was Guernsey's fourth loss in their last six games in Isthmian League Division One South.